Another great SATURN (SEI Architecture Technology User Network) Conference in Denver last week. The cast of interesting and directly applicable topics was led by two main characters: microservices and event sourcing. Apart from those leading roles, there were supporting roles for functional programming, and of course the popular returning role for good old uncle agile architecture. Below is a day-by-day account, with links to the video recordings for each of the sessions discussed. A great start with a keynote from @KevlinHenney, stressing the need for attention to details – even (or especially!) for architects. As Edsger Dijkstra wrote, “The purpose of abstraction is not to be vague, but to create a new semantic level in which one can be absolutely precise.” Sometimes architects hide behind the “architecture as an abstraction” definition as an excuse not to go into details. However, sometimes the devil is in the details, meaning a tiny detail may have substantial risk and cost impact – meaning it is architecturally significant (according to Risk and Cost Driven Architecture). The highest impact speaker this year was undoubtedly Sebastian @vonConrad, whose first session had some great tips about being an influential architect among 23 fully autonomous teams. If you have no decision authority, influence the decision makers (in the teams). And people are most likely to be influenceable when you help them. Sebastian did this by setting up an architecture guild, facilitating inter-team knowledge sharing and peer reviews based on very light-weight architecture documentation for projects (“project docs”) and architectural vision (“light on the hill”). Especially his approach for setting technology standards without stymieing innovations (“sensible defaults”) was refreshing. (I unfortunately had to miss Sebastian’s second session on event sourcing because it coincided with my own session on architecture life cycles – but I will certainly watch the recording once it is published.) Later that day, Stefan Toth (@st_toth) spoke about more or less the same topic under the title “the distributed architect”. Stefan presented a very nice model to decide how “crowd-sourced” your architecture can afford to be, with four levels of central roles: fully crowd-sourced (no architect), architecture marshalls, an architecture owner or the classic architect. 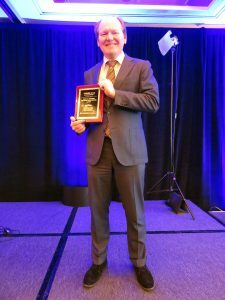 George Fairbanks (@GHFairbanks), one of SATURN’s organizers, won this year’s new directions award for his talk on functional programming, which appears to be coming back in fashion (remember LISP?). George explored the ramifications of this programming paradigm on the architectural level, in a fun way (which included a marbles game). 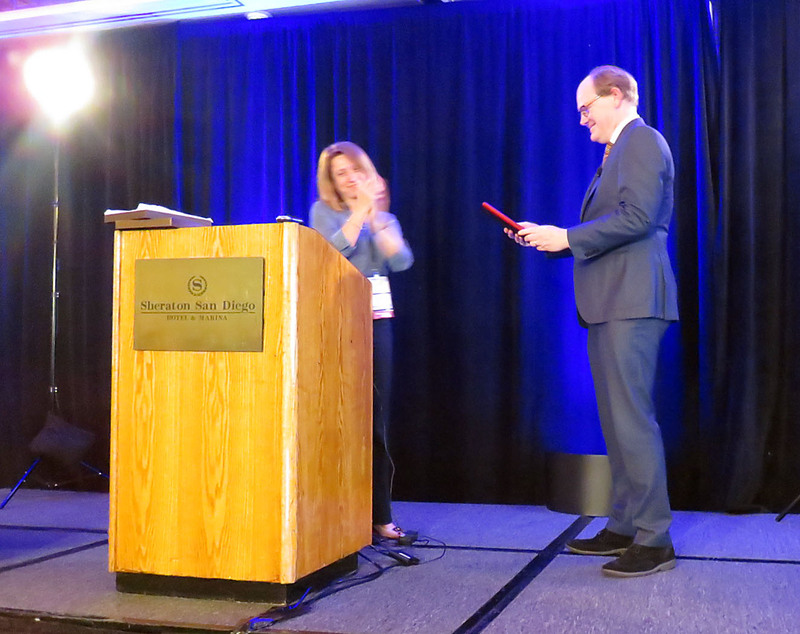 The final conference day started with @RuthMalan‘s acceptance speech for winning this year’s Linda Northrop Software Architecture award. My successor made a passionate plea for visualizing designs that should be based on objective reasoning. After a hilarious bout of slide roulette, I attended @ThePaulRayner‘s session on event storming, a workshop form for soliciting requirements from stakeholders built on the concept of events (rather than business objects) as the primary entity. It resonated nicely with my plea for time as a first-class citizen in architectural design. Paul’s method seems to be mainly focused on business scenarios, it would be nice to try it out as a way of soliciting change scenarios for architecture roadmapping. Later, @michaelkeeling gave a nice report of his work introducing architectural decision records (ADRs) in his team at IBM Watson. He observed that modules that have documented ADRs appear to have less rework and greater general design awareness. He gave a series of nice tips in software development teams: — Store with the code, use plain text — Delegate ADR creation — Peer review as you would code — Foster a documentation habit — Make a decision, then document it — Not everything is an ADR! My own experience with ADRs is mostly in a higher level solution architecture context, but points to the same general principles: the threshold to documenting ADRs should be as low as possible, so try to store them in a tool or platform that your team is accessing on a daily basis already – and then coach them. This was my fifth SATURN conference, and just like the previous years I returned home full of new ideas and inspiration, and with many useful new contacts. You can find recordings of all sessions on the SATURN YouTube playlist.I am already looking forward to the 2018 edition in Plano, TX. This entry was posted in Conferences on 14 May 2017 by admin. 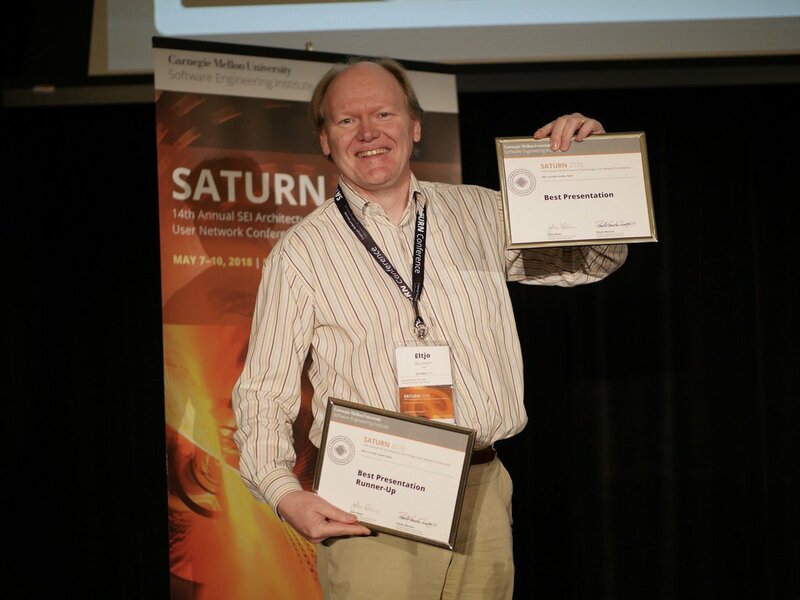 Videos of many SATURN 2015 presentations are now available to view on-line. 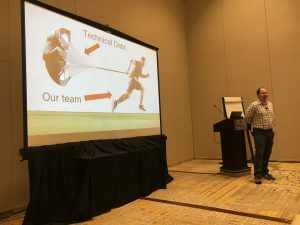 Another great SATURN (the Software Engineering Institute (SEI) Architecture Technology User Network) conference in Baltimore this year. The setting was a bit surreal – due to social unrest and a curfew(!) we couldn’t really explore the city during the conference, and were pretty much confined to the conference hotel. After three days of intense knowledge exchange, it was a pale, squinting collection of software architects that emerged from the Lord Baltimore Hotel – tired but satisfied. As predicted by George Fairbanks at the start, it was also the “most annoying SATURN ever” – in the sense that there were four parallel tracks, and whichever one I chose to attend, I always knew that there was at least one other very interesting thing going on in one of the other “salons”. Fortunately, many sessions were videotaped and can be viewed on-line. Last year‘s most prominent topic was DevOps, and it was still prominent on this year’s event. 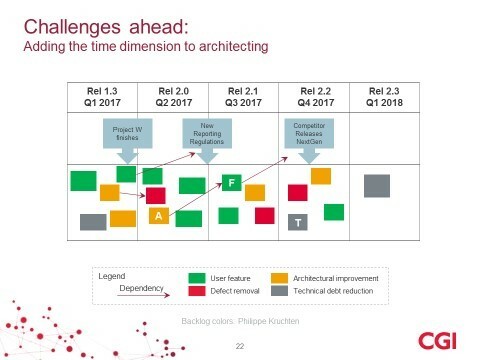 Another topic that keeps attracting attention is the interplay between architecture and agile delivery, the topic of my own two contributions. The rest of the sessions could roughly be divided in coding-oriented (in which MicroServices was the most discussed topic) and business-oriented subjects. I mostly attended the latter. The conference opened with a great keynote address by Mary Shaw about the progress of Software Engineering as an engineering discipline. Mary had studied various engineering disciplines and abstracted a simple and elegant lifecycle, highlighting the growth of a discipline from art to production, commerce, science and eventually engineering. According to Shaw’s model, something is a real engineering discipline if the combination of science, art, production and commerce allows “ordinary” trained people to be systematically successful (as opposed to an art that can only be masted by virtuosi). Mary’s conclusion was “we aren’t quite there yet”. Right after the keynote it was my turn to lead a participatory session on “Maximizing your business value as an architect“, and I felt priviliged that the room was packed with 50 practicing architects from all kinds of organizations. The discussions were lively, most participated vigorously in the exercise (“prioritize architectural concerns by risk and cost”), and almost all participants indicated they would be able to use the approach immediately in their daily work. I’d like to thank all participants for making this such a gratifying session. On Wednesday morning, InspearIT’s Jochem Schulenklopper gave the presentation that would win the Architecture in Practice award: “Why they just don’t get it: communicating architecture to business stakeholders.” Jochem made some excellent points about the need for architects to learn and communicate in business stakeholders’ language. Learning a language is not trivial and requires exposure. And using a modeling language like UML or ArchiMate to communicate with business stakeholders is useless: you will quickly find yourself explaining the language in stead of explaining the architecture. After the session, even Len Bass indicated that he had learned new insights from Jochem’s talk – a true compliment! Wednesday afternoon started with another great keynote, by Gregor Hohpe: “It’s good to be architect”. Gregor had some very interesting insights into the value of architects to organizations, such as “If you make architecture a second class citizen, you will attract second-class architects who build a third-class architecture”. His metaphor of the “architecture elevator” immediately struck a chord: the value of architects can be measured by how many levels of hierarchy and abstraction they can traverse quickly. Good architects talk to technical engineers and translate their concerns in such a way that they get the attention they deserve at C-level. Conversely, they make the translation of policy and business goals all the way through to the levels below. Gregor posted his own SATURN impressions here. 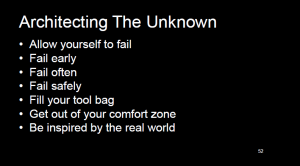 Thursday morning we discussed Fast and Slow Thinking for architects with Rebecca Wirfs-Brock: apart from “be aware of all your biases”, Rebecca had a valuable tip about using pre-mortems at the start of projects to fight some of the more dangerous biases. A pre-mortem is a group exercise in which attendants imagine they are in the future: the project has failed, and everyone describes the scenario that led to failure. A great remedy against WYSIATI (What You See Is All There Is), availability bias etc. I also gave my presentation “Agilizing the Architecture Department”, about our experiences implementing RCDA at ProRail. Thanks to all participants who were cooped up together and made this another great SATURN. And it’s not over yet: we still have to watch the recorded trackes that we didn’t attend, so we’ll be busy for a while yet. Next year: San Diego. This entry was posted in Conferences on 4 May 2015 by admin. SATURN (the Software Engineering Institute (SEI) Architecture Technology User Network (SATURN) Conference) has become my favorite annual professional event. What a great mix of architects, developers and researchers, and what a nice way to learn from each other. The pervasive theme at this year’s SATURN was DevOps. 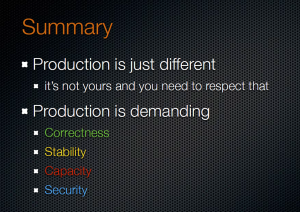 Throughout the conference it became clear that DevOps is not just a hype-movement “taking agile to the next level”. DevOps will quickly become the standard way to produce a significant part of the world’s software. It is the only way to achieve real web-scale IT, supported by a high degree of automation – and by a strong architecture foundation to ensure qualities like reliability, availability and security. The goodness started with Stephany Bellomo and Rick Kazman’s tutorial on the architectural foundations for achieving DevOps goals – most notably “deployability”. Stephany and Rick have looked into a number of cases to identify architectural strategies and tactics to decrease deployment time. They did not find any new techniques, but found that existing strategies often needed to be revisited to achieve DevOps goals. According to Stephany, DevOps forces architects to think about streamlining: removing stuff rather than adding. In some cases, this meant removing SOA components… which was ironic, since Stephany is one of the SEI’s leading SOA experts. On Tuesday afternoon, I gave my own tutorial about Agile Solution Architecting. We had a nice crowd, which included OO design guru Rebecca Wirfs-Brock. Great discussions and feedback. 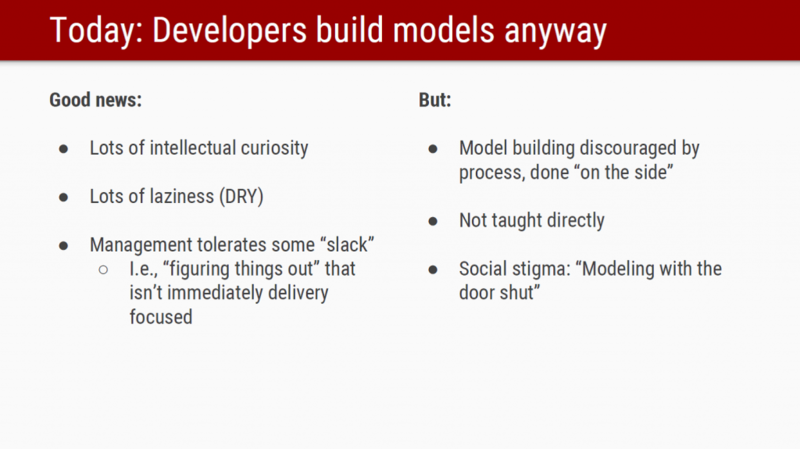 Wednesday had a nice keynote on refactoring by Bill Opdyke of JPMorgan Chase – some interesting points about making the business case for refactoring to your stakeholders reminded me of a previous blog post. In a session on Customer Collaboration, Samsung told us how they analyzed Twitter data to gather quality attribute requirements for their Galaxy model S5 – quite revealing. My presentation on the Costing View of Architecture was part of the afternoon’s Leadership and Business session. The final session on Wednesday triggered some great discussion on fostering architecture communities in companies, which led to the creation of a LinkedIn group to allow the discussion to continue after the conference. All in all, a great week, many new ideas and new friends. Many thanks to all participants and organizers! This entry was posted in Conferences on 5 June 2014 by admin.